The blue Visa: this is Polleke! This is Polleke, Monieke's two cylinder Visa. 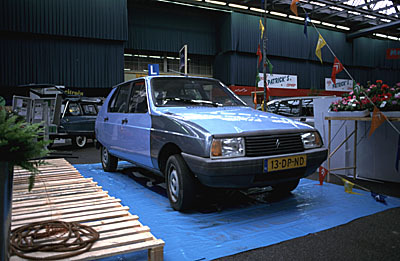 Polleke was born in 1984, and came on the road in Belgium in January 1985. 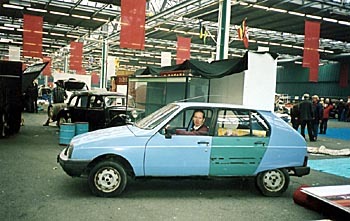 It is the most basic Visa, without parcel shelf or wheel covers. But she does feature head rests in front and a rear wiper. 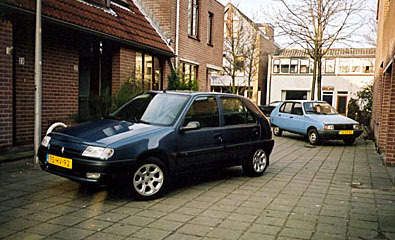 In September 1999, she was imported into The Netherlands. We heard of Polleke during the castle tour of the Dutch Visa Club on October 14, 2001. 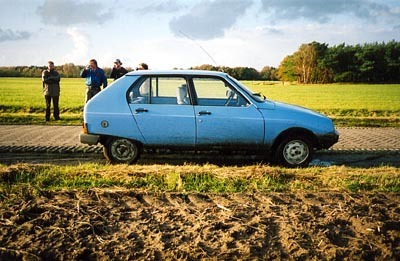 The car was offered for free to a good home by someone in Bladel (Northern Brabant). When collected on October 24, 2001, the Visa had stood still for one year. Nevertheless, the engine started almost at once. 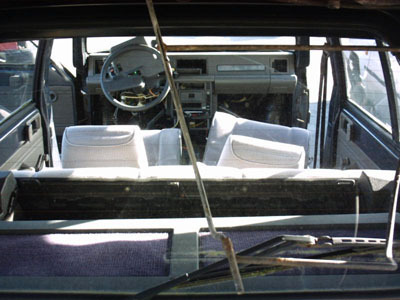 One sill seems to be bad, but otherwise the body work has not deteriorated all too much. Things to replace were among other things the front bumper (missing), the left rear door (rusty) and a broken headlight unit. Polleke was tested in January 2002, but it failed. The second test was more successful, so now we have her back on the road. 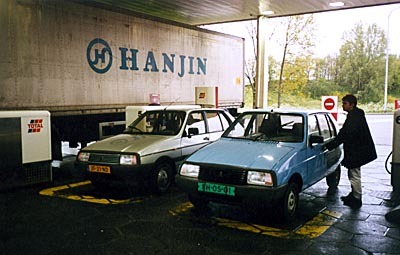 Alphen aan den Rijn, October 24, 2001, 8.00 a.m.: Erik Post Uiterweer of Post Uiterweer Restaurations has generously lent us his Nissan Patrol and trailer, to enable us to fulfil our mission to rescue a blue Visa, somewhere in Bladel, Brabant , The Netherlands. Near Utrecht, we meet up with Angela Bruurmijn of the Dutch Visa Club, who tipped us and who will accompany us to Bladel. Left: Bladel, 11.00 a.m.: what's lurking behind that fence? Far left: Angela offers assistance. Left: ready for the journey back home. Right: Visa behind offers pleasing rear view. Head turning convoy. Or was it head shaking? On arrival in Alphen aan den Rijn: Polleke is taken off the trailer (above), and Monieke does her imitation of drag racing down the street (left). Afterwards, she poses proudly with her new acquisition (below). The next day: Polleke visits the workshop of Post Uiterweer Restaurations. After some fiddling, the headlights functioned (far right). 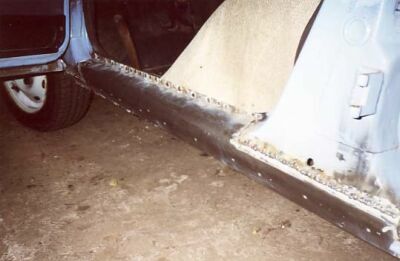 Front bumper, however, would not fit without missing inside bar. 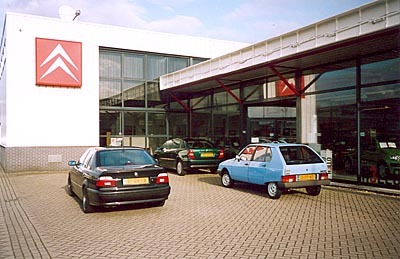 On our search for usable parts for our blue Visa, we heard of Garage Tromp in Waddinxveen. The Visa we found at Tromp's estate yielded some small parts. Its engine is reputed to be very sound and will in future probably power my 11RE. Monieke was attacked by chicken and had to get a an injection against tetanus. A very, very rusty Visa 11RE at another scrapyard supplied a surprisingly good front wing and a complete front bumper. 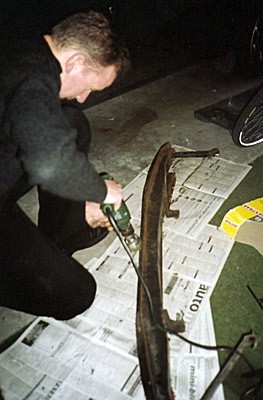 Left: bumper inside bar was not rust free, so it was derusted and heavily treated with Hammerite before fitting (photo © Monieke Kroft). 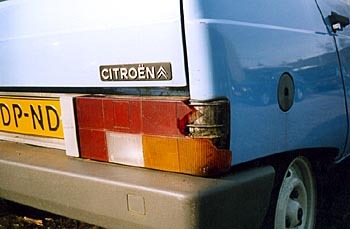 Right: bumper bar in place. 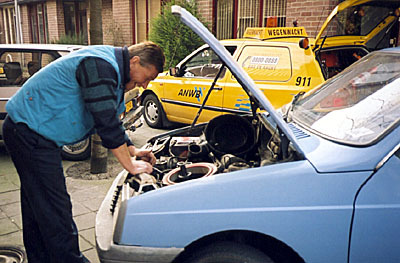 Left: Post Uiterweer crew showed to be helpful once more. 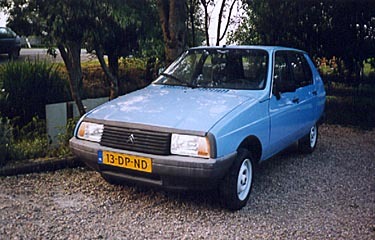 Right: with front bumper, Polleke might pass her test and become road legal again (or so I hoped...). 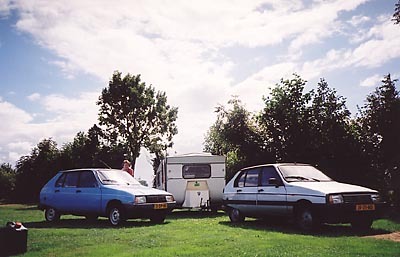 Polleke (right) and her fast brother Gerrit (left, see Silver Visa), waiting for the summer. 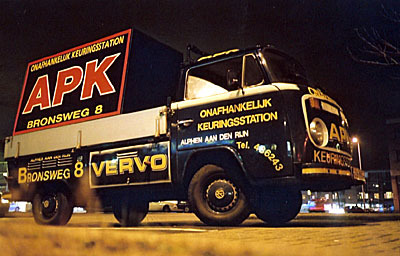 In January 2002, Polleke was tested by local APK-station Vervo. Twelve faults were found. Polleke's faults were not too serious: all was prepared to have her sorted out completely. Saxo gets votes for the more good looking car, but is by far not as cute as base spec Visa. Gerrit, also awaiting his next test, soon joined Polleke in the street near our house, and provided nice contrast. 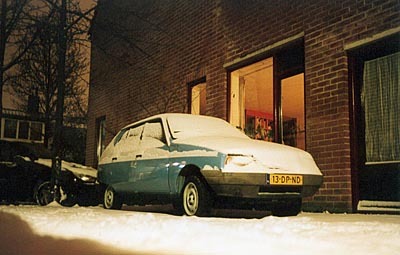 (January 2002). One of Polleke's problems was a worn driver's seat belt. Our friend Thijs van der Zanden found a Visa 11 RE at a scrap yard in Helmond (Brabant), which provided a good seat belt for no more than € 7,50. The Visa in the yard looked not at all so bad, but this is just what happens in our overstocked, material world... (photos © Thijs van der Zanden). After failing her first test, plans were made to make the second time more succesful. 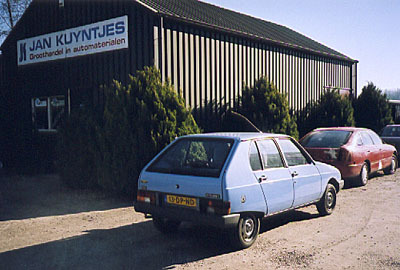 In February, 2002, we brought Polleke to the garage of Jan Kuyntjes in Nieuwland (south of Utrecht). by ferry. Here we line up. 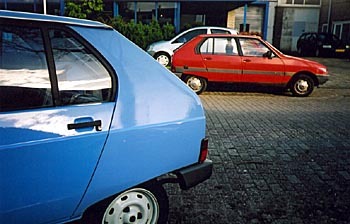 Left: Polleke, in three different shades of blue, is collected from the workshop. 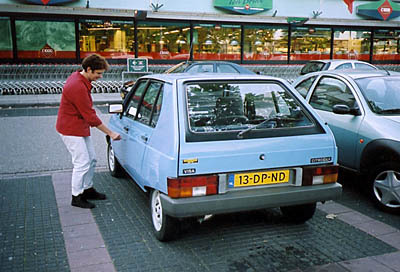 Right: on arrival at the Veemarkt. 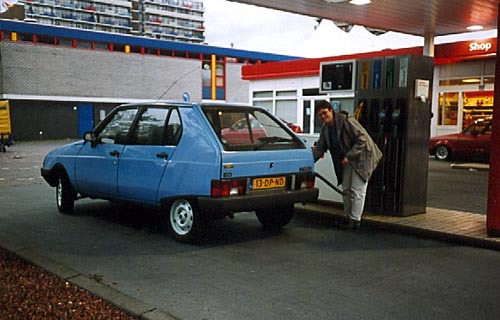 Polleke, not having passed her test yet, had to be driven on dealer's plates (photo © Thijs van der Zanden). ...although, we have to confess, she was not the only blue Visa around. Left: WHAT do you mean, "not the right colour"? (photo © Monieke Kroft). 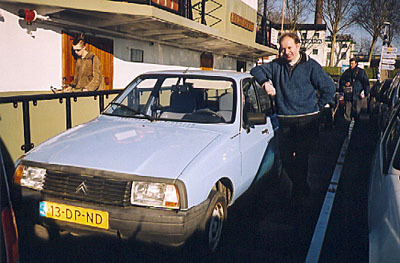 Right: Polleke returns to Kuyntjes workshop after Citromobile, accompanied by GerriT. Polleke's brakes, although looked after, did not convince. On inspection, rear brake cilinders turned out to be leaky. Finally, in May 2002, Polleke got ready. She passed her APK, after the rear brake cylinders, the exhaust, and several other smaller parts had been renewed. 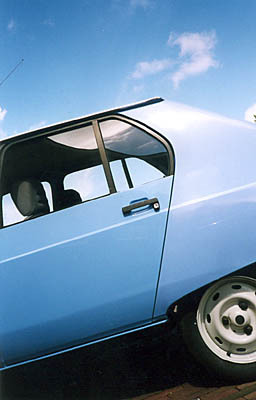 The new panels (right front wing and left back door) were sprayed in the right colour, and the wheels were derusted and resprayed, using the correct grey paint. Especially those freshly painted wheels do her much good. Some small spots of rust have yet to be treated, but that will only be a small job, to be done by ourselves. 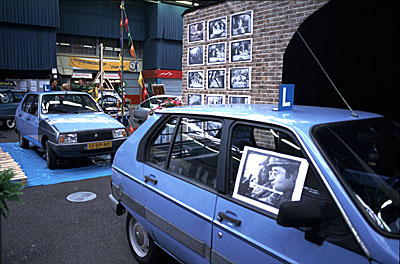 Above left: Polleke waiting to be collected at the Kuyntjes workshop, May 2002. Above right: If we had a good neighbourhood reputation, Polleke's present appearance would not spoil it. 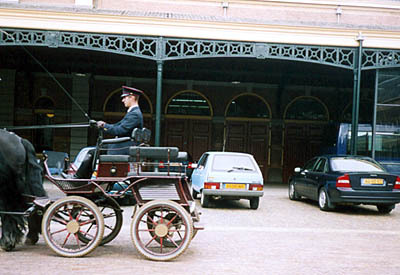 Below left and right: Polleke goes royal: a visit to the Royal Stables (the place where the Dutch Queen's golden carriage is kept) in The Hague, July 2002. 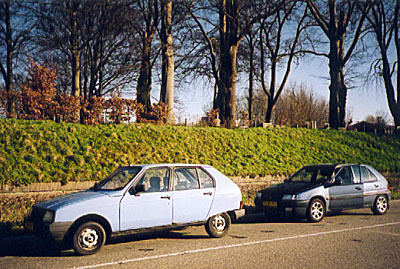 Above left: Monieke is very happy with Polleke as a runabout for shopping and touring. 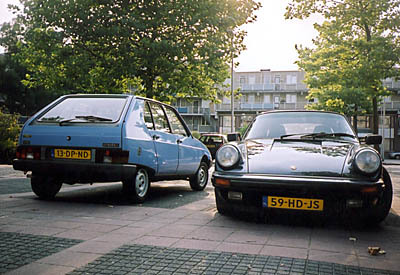 Above right: Polleke or Porky: which one is the most exclusive car after all... Below: composition in various shades of blue. Right: Oops! Broken rear light was result of clumsy reversing. No real harm done, but it will be replaced by another unit soon. 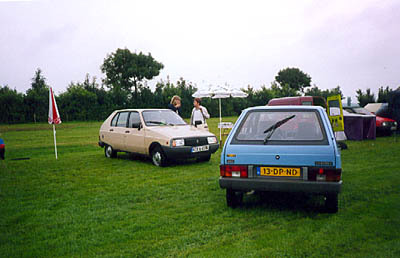 Below left: Polleke participated in club tour in November 2002, and got herself very dirty. 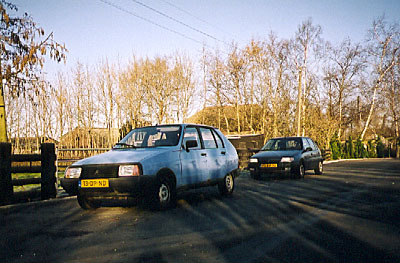 Below right: Polleke meets her twin sister Gerda, November 2002. Left: Polleke is one of very few Visas left in my home village (almost all are in my ownership...). Local dealer Johan Zwart is friendly enough, but can hardly offer any help in our search for spares. Above left: technical day of the club in late November was one of Polleke's last outings for 2002. Blue Visa beside it was another one given away for free. Above right: in the workshop. Slight dent in left rear wing seems to have appeared spontaneously. Left: oh dear...a job for the welder on its way. Polleke showed some severe rust in rear inner wings (just visible behind the suspension). Right: the winter of 2002/2003 was rather cold. Polleke stood it well. 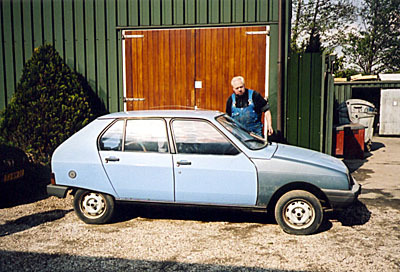 In April 2003, Polleke passed her test first time after her rear inner wings were welded. 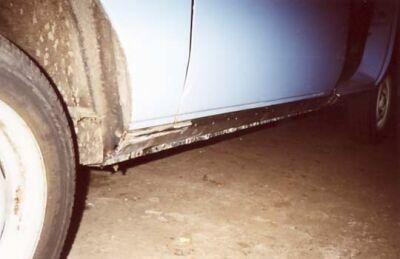 The ding that marred her left rear spat was removed with use of the sucker of a towel hook [...], and some small spots of rust were treated. Bottom of rear right door skin showed some rust, as did the left front wing and the hatch. Touching them up is sufficient for this moment. 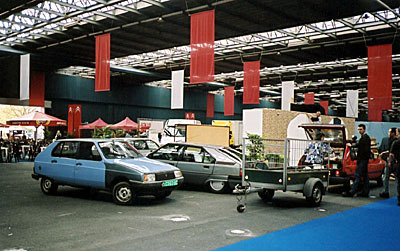 Polleke and GerriT both attended the World Meeting in Meerkerk in August 2003. 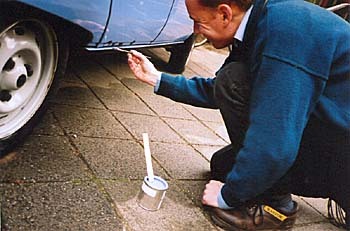 Polleke's flat paint was succesfully polished with a lot of Commandant in the spring of 2004. She almost looked like new afterwards. Even better, she faultlessly passed this year's APK! Right: ever present dent above filler cap has become more prominent for some unknown cause. Far right: heavy snow in March 2005 was no problem for Polleke. 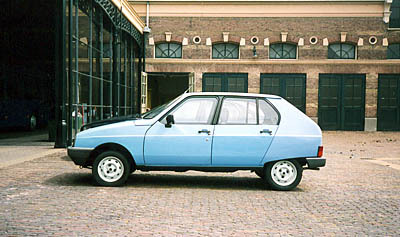 Polleke failed the APK in May 2005, due to a rotten sill, two holes in the chassis and a leaking petrol tank. All were repaired. Broadly speaking, she is still remarkebly solid. It is hard to believe that she was nearly written off four years ago. Another problem were the rusty rails of the wind up windows, which were replaced by rust free ones. Right: line up op Visas at Nehren, with Polleke second from left. Far right: Polleke waiting for the collective tour through the surroundings of Nehren. Left and right: Polleke during the summer meeting of the Dutch club in Epen (Limburg) June, 2006. Right: Polleke participating in the fall tour of the Dutch club in a typlical Dutch scenery, October 2006. Far right: sticky breaks caused some exciting moments during a club outing in April 2007. 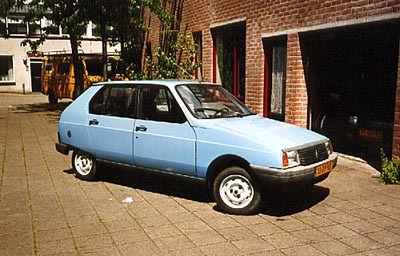 Nevertheless, two weeks later Polleke once again passed her test faultlessly. Left: Polleke goes cultural. Right: participating in a club tour, October 2007. 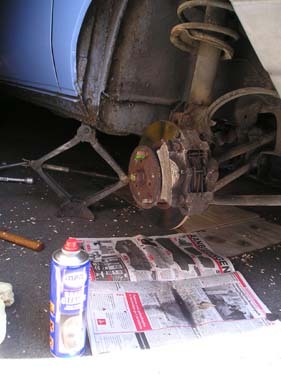 Left: replacement of the rear shock absorbers, needed for the yearly test in May, 2008, proved to be tricky when the bolts did not come off. 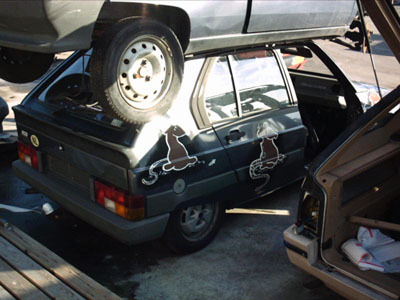 Luckily, the rear suspension of the brown Visa, (waiting for scrapping in the background) could serve as a replacement. Right: Polleke is being taken out for a winter's drive. Of my stable of three different powered Visas, she's still the one with the biggest fun factor. Far left: another highlight in the life of Polleke: she drove a young couple at the day of their marriage in March 2009. Left: Polleke and Hiawatha having fun together, April 2009. 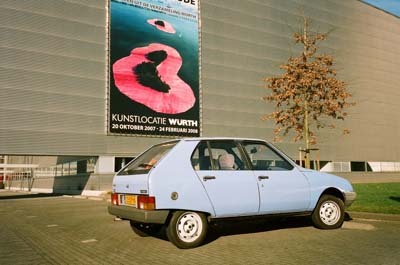 Polleke visits the Belgian Citroën garage in Lommel where she was once sold, May 2009. A rare moment: Polleke breaks down with electrical problems during the fall tour of the Dutch club in Brabant, October 2009 (photos © Monieke Kroft). More adventures of Polleke will be coming soon. last updated: April 11, 2010.